Jessica Williams, 19, had her spleen removed as a result of her injuries from the Times Square attack. TIMES SQUARE — The family of a New Jersey teen critically injured in last week’s Seventh Avenue rampage shared a devastating photo of her in a hospital bed — and is now asking for help in footing her medical bills. Jessica Williams, 19, skipped class at Dunellen High School to head into the city for senior skip day last Thursday, her cousin Nicole Guild wrote in a Gofundme post. 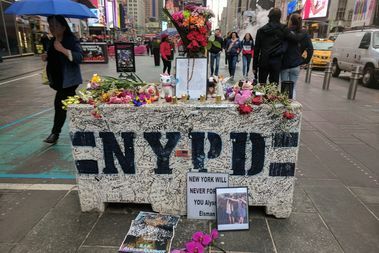 But a morning of fun turned tragic when drugged-up Navy veteran Richard Rojas, 26, plowed his Honda Accord into a crowd near West 42nd Street, killing 18-year-old tourist Alyssa Elsman and injuring 21 others, including Williams, according to police. “She is currently in critical condition with many surgeries and a long road to recovery ahead of her,” Guild wrote of her cousin. "Her spleen was removed yesterday and the damage to her face was stitched up today. Her leg is still broken and will require surgery at a later time. 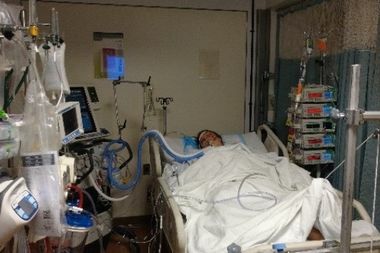 She is still in traction due to the open fracture pelvis and that will also need to be addressed more at a later time." The father of the Michigan teen killed by a Navy veteran last week left an emotional letter at the scene. The Gofundme campaign had raised more than $24,000 as of Tuesday morning. Rojas has been charged with murder, attempted murder and vehicular manslaughter. Police and prosecutors have said he was on a premeditated mission to kill, then be killed by police, telling the first officers on scene that they should’ve shot him to stop him. The family of another critically injured victim, Canadian tourist Elena Avetisian, has also launched a Gofundme campaign. Meanwhile, the father of Alyssa Elsman, whose 13-year-old sister was also seriously injured in the attack, penned a heart-breaking thank you note to the city at the scene where his daughter died.